Audi’s A6 has just gone under the knife for a midlife make over, but according to Audi it’s a lot more than that. We take the popular German sedan for a spin around the beautiful roads of Udaipur to see what they are talking about. The luxury segment is growing rapidly as people have started appreciating the benefits of modern technology that the cars are equipped with. As a result manufacturers are trying to cram in as much technology as they can because of which luxury cars keep getting facelifts almost every other day with the addition of more and more features to entice the buyer. Technology which was once available only in the premium luxury cars are now getting filtered down to the lower models giving them more value and desirability. Audi seems to be following a similar trend as well and have just come out with the updated A6 which they claim to be is the benchmark in its segment. The Audi A6 has always been the more elegant and less flashy kind. In fact that’s the case with most Audi’s and the A6 was no different. However with the update, the new A6 looks a lot more aggressive and not to mention sportier as well. At the front new A6 gets a new single frame hexagonal grille and the bumper gets redesigned as well with a new lip spoiler and newly designed air dams. But the most distinctive feature on the front are pretty much the matrix headlights which come down from the A8 and look fantastic. Not only do they look fantastic but function just as well too. A bunch of 19 LED’s per headlight paired with four reflectors produce the high beam light which illuminate the road ahead with blinding oncoming traffic by automatically switching off individual LED’s. On the sides, the trim strips over the side windows get a gloss black finish which along with the new V 5-spoke alloy wheels give the car a sporty touch. Moving to the rear, you have LED tail lights flanked by a neatly integrated spoiler and a nice fat diffuser with twin tail pipes completing the look. 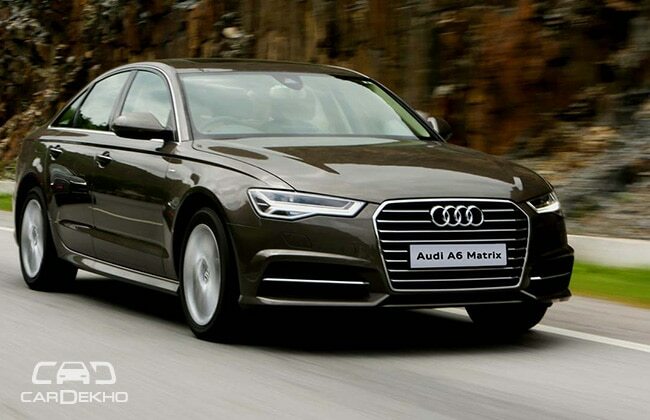 Even though the changes are subtle, the new A6 looks brilliant and a lot fresher than its predecessor. Audi has done a fine job sprucing up the exteriors and we definitely like it. The interiors while remaining largely unchanged when it comes to the layout or space, get a host of new features added. Getting in the driver’s seat, you are welcomed by the wrap around dashboard which now gets fine grain ash natural brown inserts. The Milano leather seats can be adjust in a multitude of ways and in quick time as well thanks to the memory function. The instrument console is pretty much the most legible unit in the market thanks to its layout and colours and gives out all the information you need as well. The power retractable 20.32 cm monitor pops out from the centre of the dashboard the moment you turn the car on. There is also a four zone climate control system now for individual temperature preferences. The new Audi A6 Matrix is equipped with the Next Generation Modular Infotainment Platform which offers a host of new functionalities. I also decided to check the rear seat comfort since the A6 is also going to be used by rich bureaucrats who will buy the car just for its rear seat comfort. Getting in at the back, there is plenty of legroom at the rear, but should you need more, the co-driver seat is electrically adjustable from the rear at the push of a button, pretty darn cool! The boot capacity at 530 litres is good enough to swallow plenty of luggage and as you can see in the pic, a colleague of mine in absolute comfort as well. And just in case I decided to trap him inside the boot, Audi has provided a boot lid release from the inside as well. Apart from this you also get a multifunction steering wheel with paddle shifters, cruise control and then some. The new A6 also gets a Bose surround sound system which from its specs looked great however, streaming music via Bluetooth, we found the music reproduction quite artificial and this was even after we played around with the settings. However we reserve further comments till we get the car for a longer review where we will try playing files with a higher bit rate. You also get Bluetooth interface, an advanced voice dialogue system, Audi parking system plus and a remote for the MMI system. The new A6 basically has everything you, your neighbour and his neighbour would need from a car. Powering the A6 is the same 2.0 TDI engine as before, however in its current state of tune, the 1968cc engine pushes out 190 PS @ 4200 rpm and 400 Nm of torque from as low as 1750 rpm. Both horsepower and torque figures have gone up. To use all those horses well, Audi has chucked out the earlier multitronic gearbox and in its place used the more advanced 7-speed S tronic transmission. Getting out of the city, the engine feels more than adequate and the gearbox does a brilliant job of keeping the car in the right gear during slow moving traffic. The moment we hit the clean empty highways of Udaipur we put the engine to the test. The Audi Drive Select gives you four choices of driving modes, comfort, Auto, Dynamic and individual where you can fed in your preferences. Even with the driving mode in comfort, the Audi responds well when you bury the throttle. The new S tronic transmission harnesses the slightly lowly horsepower for its weight (1830 kg) quite well. But for sheer performance, the 2.0 TDI feels a tad too little for this big car. Now we know that the target consumer for the A6 isn’t looking for scorching performance, but we think there is no harm in having a little extra firepower. The 3.0 TDI which would come in later will suffice those needs perfectly well. Even then, Audi claims that the 2.0 TDI has enough to propel the Audi to a 100 km/h in 8.5 seconds and go on to hit a top speed of 226 km/h (which we almost managed to hit) which isn’t too shoddy. We will confirm those numbers when we get the car for a proper test. But where the small capacity engine and that wonderful gearbox also do wonders is in the fuel efficiency department. Audi claims a whopping 18.5 kmpl which again we need to confirm in real world conditions. But all said and done the A6 2.0 TDI has more than satisfactory performance for its intended user. This is another place where the A6 benefits from technology filtered down from the bigger A8. The A6 now gets Adaptive air suspension that adjusts to varying road conditions as well as adapts to the different driving modes. While we have tried various forms of air suspension before we think Audi has managed to get the ride quality bang on. Switched to comfort mode, the Audi absolutely glides on the roads offering pretty much a magic carpet ride. And it’s not just on smooth roads. We put the car through plenty of potholes, speed breakers and bad roads and the Audi was simply unflinchable. All throughout it remained calm and composed with just a thud that you could hear but not feel. Even in dynamic, the suspension feels quite supple and forgiving. We put the car through some high speed corners and the Audi dismissed them quite easily with only my co-passenger sweating a bit considering the speeds we were carrying. The adaptive air suspension has made the new A6 pretty much the most comfortable sedan in its segment, and that’s saying quite a bit considering Mercedes-Benz, its direct rival is known for its exceptional ride quality. If its comfort you need, Audi has the covered and how! With this update, Audi has worked on the A6 quite well and made sure it’s enough to carry it through till the all-new A6 comes out and while at it give a tough time to the competition as well. Priced at Rs. 49.5 lakh ex-showroom Mumbai and Delhi, the A6 sounds like an excellent value proposition considering the features that it boasts have been watered down straight from the much expensive A8. Yes it could do with more power but then the 3.0 TDI coming later will cater to the rare power hungry bunch, but for the rest, the new Audi A6 2.0 TDI will do the job. Audi has just put itself ahead of the competition and we can’t wait to see how the others reply. Game on then!